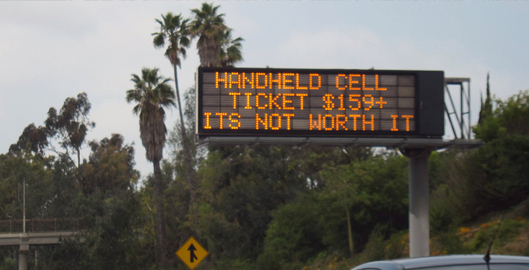 On a recent trip to Florida, I got a rental car and during the 1.5 hour drive from the airport to my destination I was shocked to see the number of people clearly texting while driving or talking on the phone. Turns out that Florida is one of five states where texting while driving is still legal. As I was driving, I kept hearing the text message and email notifications. One friend must have sent me five texts in a row! I’m going to be honest, as soon as I heard the notification sound, I automatically wanted to reach for my phone. But, given that I don’t drive much and I was completed focused on safely reaching my destination, I didn’t pick up my phone. This whole experience has me thinking about habits and behavior and how this might apply to the problem of texting and driving. I’ve been interested in psychology, human behavior, and technology for while, I find it completely fascinating. 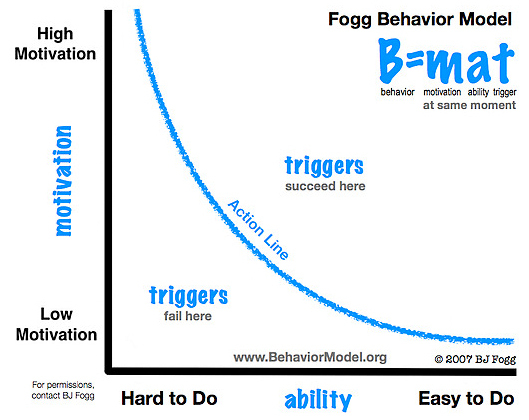 BJ Fogg (@bjfogg) from Stanford, developed a Behavior Model which states that in order for a behavior to occur at least one of the elements of motivation, ability, and trigger must be present at the same time. This behavior model perfectly characterizes why it is so difficult to get people to stop driving. People are simply conditioned to behave in certain ways when it comes to their mobile phones. As the model states, at least one of the elements of motivation, ability, and trigger must all be present at the same time in order for behavior to occur.The trigger is the familiar audio notification. The motivation is to find out what that person has said. And unfortunately, the ability for them to respond is inches away from the wheel, just within a short reach. More than likely, most of the time more than one of the three elements is present, which makes it all even more dangerous. I wholeheartedly applaud and support all forms of education about the dangers of texting and driving. However, I fear that those efforts don’t address the root cause of the problem. To truly reduce texting and driving, we must figure out to break the Behavior Model. If behavior exists when one of the three elements are present at the same time, then we must come up with ideas that remove at least one of the elements from the right side of the Behavior Model equation. There’s really only one trigger we can deal with and that’s the notification of new inbound messages or calls. Naturally there will be triggers that make someone want to send a message or place a call (eg. guess what I just saw, heard, remembered …) but given that those triggers are inside someone’s head or in their surroundings, we can’t do much about them. Thus, we’re left with only triggers that signify new messages. By default, this issue of inbound triggers will be dealt with when I explain the next element of Ability. How do we take away the ability for people to send or receive messages? The first idea that comes to mind is to rely on to the accelerometer. If the accelerometer determines that the device is moving greater than x speed, then the device would automatically be put into Driving Mode. In Driving Mode, the phone would not be allowed to send or receive messages. But, that isn’t realistic. What if you’re just passenger in the car and not even the driver?! Or, what if you’re in a traffic jam and haven’t moved in 20 minutes? Situations such as these make it seem as though relying on some external factor to determine if someone is in a car is probably not the best approach. So, we have to instead consider that putting a phone into some type of Driving mode must be deliberately done by the driver rather than automatically by the device . Yes, I know that’s tough to imagine that we could train people to do this. It’s hard enough to get people to turn their phones off for takeoff. How then do you motivate people to switch their phone on Driving mode in the first place? With the right motivators, it could work. Instead of taking drastic measures that automatically put a phone into Driving mode, how do we have people make a deliberate choice to turn on a hypothetical app that we’ll call the Driving Mode App? What if this app could know how far you drive, how many messages or calls you didn’t respond to or read, and then rewarded you for that good behavior. For example, imagine that yesterday I commuted 60 miles. During that time, I received 5 text messages, 1 phone call, and 4 emails. But, because I didn’t respond to or read any of the messages, and I did not answer the call, I was given some type of currency that eventually (as it accumulates) results in an insurance discount or other tangible reward. If drivers can be rewarded for a certain number of years of accident free driving, why can’t they be rewarded for a certain number of miles without texting? We still need to consider how we deliberately get someone to switch their device into Driving Mode. What if there was a sensor that you placed in your car. Every time your phone was within x feet of that sensor this would trigger a notification suggesting that you should enable Driving Mode. Again, just an idea! Instead of removing the ability for someone to respond or the trigger to notify them a message is received, what if we just worked hard to change the motivators? If we could create the right motivators, then a new behavior model could be formed that could result in less texting while driving. I’ve clearly not spent time thinking this through in great detail. However through my recent experience being on the road as an actual driver, I’ve realized just how bad the problem is, not just from observing others, but from being in the drivers seat, knowing there’s a message, and being confronted with the temptation to answer or wait until later. As a user experience designer and someone who’s curious about behavior, psychology, and technology, I find the problem of texting and driving that we could possible help solve, because unfortunately I don’t think that education and awareness are going to be enough.